Millions of Filipinos are grappling with extreme devastation, Richie Incognito defends an expletive-filled message to Jonathan Martin as “coming from a place of love,” and a falling satellite crashed into Earth (but apparently missed you). Beyond despair: Imagine clutching your children during the wrath of a cyclone, only to have 16-foot-tall wall of water crash through your city, rip them from your arms and wash them away into the ocean. That’s exactly what happened to some parents in the Philippine city of Tacloban. 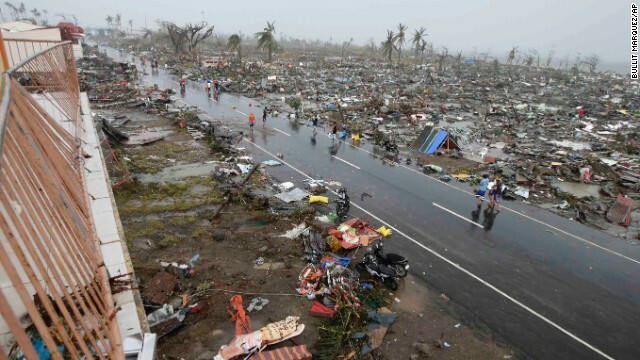 As many as 10,000 people are now feared dead after Typhoon Haiyan - perhaps the strongest storm in recorded history - leveled villages and left hundreds of thousands homeless. We have a team of reporters on the ground to bring the latest on the typhoon’s aftermath throughout the morning. And at 8 tonight, Anderson Cooper will broadcast "AC360°" live from the Philippines. How to help: No food, no shelter, no electricity. Bodies scattered on the streets. Overflowing hospitals unable to treat any more patients. That’s the brutal reality for many Filipinos who survived the typhoon but lost their homes, livelihoods and virtually everything else. "Get international help to come here now - not tomorrow, now," survivor Magina Fernandez pleaded. "This is really, really like bad. Bad. Worse than hell." International aid groups are seeking donations, but many are struggling to reach those suffering in remote areas made nearly inaccessible by the typhoon. Anna Coren will be live throughout the morning from Cebu, Philippines, for the latest on relief efforts. Not so incognito anymore: Seems like everyone's been talking about Richie Incognito’s alleged bullying of another Miami Dolphin except, well, Incognito himself. “It sounds like I'm a racist pig. It sounds like I'm a meathead. It sounds a lot of things that it's not. And I want to clear the air just by saying I'm a good person,” Incognito said in an interview for "Fox NFL Sunday." Incognito – the N word "is thrown around a lot" in the locker room. "That voicemail was left in a private voicemail for my friend." Nischelle Turner will tell us more about the saga in the 6 and 8 o’clock hours. And in the 7 o’clock hour, former offensive tackle Todd Wade will shed some light about what really goes on in NFL locker rooms. Laughing after the funeral: For weeks, prosecutors have said Dr. Martin MacNeill murdered his wife, Michele, by pushing her to get a facelift, giving her an excessive mix of drugs to take after surgery and then drowning her - all so he could be with his younger mistress. Over the weekend, a Utah jury agreed and convicted him of murder. Now the doctor who once enjoyed the high life faces 15 years to life in prison. Michele MacNeill’s sister and niece will join us live in the 7 o’clock hour to talk about their emotional roller coaster and reaction to the verdict. Watch your head: So a 2,000-pound satellite runs out of fuel in space and crashes into Earth. What could possibly go wrong? Many earthlings wondered when and where the 16-foot satellite would make its grand entrance. But fortunately, "the satellite disintegrated in the high atmosphere and no damage to property has been reported," the European Space Agency said. The 2,000lb Satellite known as the 'Ferrari of Space' has fallen through the Earth's atmosphere...you are reading this cos it missed you. What are you smoking? Miley Cyrus just had to do something to upstage her own twerking, didn’t she? Yep. This time, while accepting an MTV Europe Music Award, she pulled out what looked like a joint from a Chanel bag, lit it up and proceeded to smoke it on stage. Okay it makes sense now why @MileyCyrus lit a joint on stage. She’s in Amsterdam..
Miley smoked a joint on stage in Amsterdam.That's like buying liquor in Louisiana on a Sunday. Way to be edgy there Miles. Wingsuit + narrow Utah canyon = awesome ride: Thanks to this daredevil, you can soar through narrow crevices - without the risk! There you go. All you need to know to get an early start to your morning. Be sure to tune in to "New Day" from 6 to 9 a.m. ET, join us at CNN.com/NewDay and go and have a great new day. Miss Cyrus does what she does for the attention ; Stop writting about all the obscenitys and perhaps she may get the point ! And Oh By the Way, It's Veteran's Day!